Enso Looper by Audio Damage, Inc. Audio Damage, Inc. just released Enso Looper! It is amazing how much stuff they've managed to fit into an AUv3 interface. 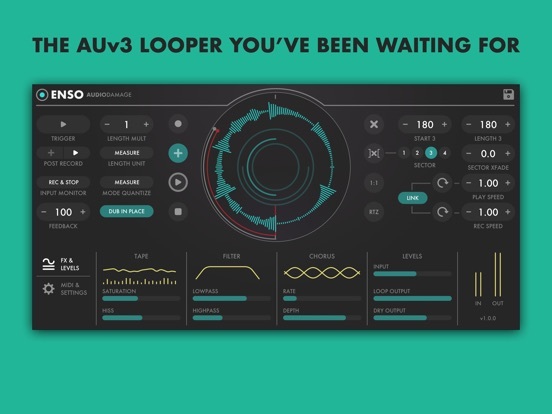 They describe the app as a "looping toolkit" which seems fair considering how many tools they're offering. Independent play and record heads open up some interesting creative possibilities. The iOS version is on sale for $6 until next month. There is also a desktop version available for $60. Beyond those basics, though, Enso takes software looping into new territory. Two Overdub modes configure the plugin for conventional looper pedal behaviour or Frippertronics-style ‘dual tape deck’ manouvres, affecting the handling of the Feedback parameter for an endless range of layering possibilities; and up to four Sectors can be effortlessly defined, each with its own start and end points, for on-the-fly rearrangement of the loop. YouTuber hymnotix has gone on record that he likes it. Here's an official demo from Audio Damage, and there is also a full 40 minute walkthrough. haha, thanks for the link. Yes I DO LIKE IT. Loopy HD will alway be my bread and butter looper but something unique that Enso has is this weird playback speed adjustment. That is heaps of fun, well worth a few $. also, check out the Audio Damage walkthrough video. Its 40 minutes and explains a lot of the deeper functions. Oh, and please add a "set current preset as default" option.. Thanks for pointing out the 40 minute walkthrough, Hymnotix! I've added a link to the post. I had been trying to explain this as an idea for an app, i had long thought bm3 should have these options added into thier sampler but this is better.